Purchasing a life insurance policy isn’t that difficult when you’re in good health but it’s a whole different ballgame when you have a preexisting condition. If you’re one of the estimated 29 million Americans affected by diabetes, getting the coverage you need may be more of a challenge. To make the process smoother, we’ve answered some of the most common questions you might have about life insurance for diabetics. How does the insurance company assess risk for someone with diabetes? The insurance company’s primary concern is going to be how long you’ve had diabetes and how good you are at controlling it. The type of diabetes you have also plays a part in determining whether or not you can get covered and how much you’ll pay for your premiums. For example, if you were diagnosed with Type 2 diabetes later in life and you’re able to manage it through diet and exercise without having to rely on insulin, you’re generally going to be a more attractive candidate for life insurance than someone with Type 1 diabetes who’s overweight. Your overall health is especially important when you have Type 1 diabetes because of the need to take insulin regularly. Diabetes has been linked to other serious health conditions, including an increased risk of stroke and heart disease. It can also lead to kidney failure in some cases. Ultimately, the insurance company is going to base its final decision on how likely you are to develop diabetes-related medical problems that could cut your life short. Having diabetes doesn’t paint you into a corner as far as your insurance choices go. It’s possible to get term life, whole life, universal life or variable life coverage, depending on which insurance company you decide to go with. Out of the different options available, term life is typically going to be the least expensive. This kind of policy can stay in place from five to 30 years, based on the term you choose. Whole, universal and variable life insurance are permanent policies which means you’re covered for as long as you keep paying the premiums. They offer an extra advantage since you can build up cash value that you can borrow against. There’s a trade-off, however, since you’ll pay more for this kind of coverage. 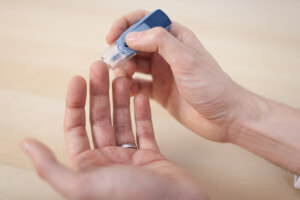 How Much Does Life Insurance Cost If I Have Diabetes? There’s no magic formula that can tell you how much more you’re going to pay for life insurance when you have diabetes. Ultimately, it all goes back to your overall health and how well you’ve been able to keep your condition in check. If you’re a diabetic and you’re also a smoker, for instance, you’re not going to qualify for the best rates. Some life insurance companies use table ratings to set premiums for diabetic applicants. With this kind of system, the insurer increases your premiums by a specific percentage based on which table you land on. For example, someone whose table rate is 1 might pay 25% more than the standard premium while someone whose table rate is 2 would pay 50% more. Instead of table rating, the insurance company may decide to tack on a flat extra premium as a safety net of sorts against the amount of risk they’re taking on. This is an additional charge you pay on top of your regular premium and it’s based on your policy coverage amount. This premium can last for the first few years or stay in place for the life of the policy. No exam life insurance for diabetics lets you skip out on the health exam and there are companies that offer these kinds of policies to diabetics. If you apply for this kind of coverage, you’ll have to fill out a detailed questionnaire about your diabetes but getting approved may take less time. The biggest difference of no exam life insurance in general is that the coverage amounts are usually capped at a lower death benefit. Before you rule out a no exam policy, click here to get a quote and see what your rate is today. Also read our what is no exam life insurance page.